If you’re looking for high-quality ball race hinges in the UK, then Ironmongery Experts is your best bet. Our masterfully crafted ball race hinge products are versatile enough to be utilised in a variety of industrial and commercial applications. 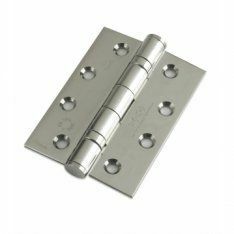 We also have a huge range of other hinges too, such as the hardy design offered by broad butts or more theft-resistant spring hinges. We also feature a selection of hinges for more specific purposes, like our piano hinges and specially designed assortment of heavy reversible hinges for cast-iron gates. If your fixture needs bronze washers, see our list of washered hinges for the numerous choices on offer. If your needs are more domestic, you may find just what you’re looking for in our light duty hinges section – for even more delicate hinges, try our high-quality cabinet hinges for best results. Sometimes you require something that’ll stand the test of time, especially when it’s being operated by hundreds of people every day; our thrust bearing hinges are perfect for situations like these, as they create almost no friction. On the other hand, if your door must clear some kind of obstacle such as a pipe whenever it opens, parliament hinges will save you a lot of grief. Our tee hinges effectively distribute weight over a wider area, so they’re ideal when you want to take the strain off the hinge or provide more efficient door control. Finally, our hook & band hinges are tailored for marine applications and scenarios where they’re exposed to seawater, so extra care is taken to ensure they remain as resistant to salt and erosion as possible. Whether you need hinges, locks & latches, or construction and joinery products of any kind, give Ironmongery Experts a call today.